neighborhood. But at the back of a former brewery, a different palette reigned. Bursts of yellow corylopsis gave way to pale magenta hellebores and pink cherry blossoms. 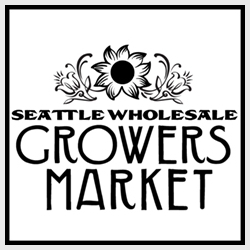 The Seattle Wholesale Growers Market qualifies as an oddity for more than just its gritty locale. While domestically grown blooms account for an average of just 20 percent of cut flowers sold in the United States, every stem this warehouse stocks originated on a family farm in Oregon, Washington, California, or Alaska. They were harvested by the market’s board chair, Diane Szukovathy, at her Jello Mold Farm in nearby Mount Vernon. Launched in 2011 by a dozen farmers in the region, the cooperatively owned market epitomizes an emerging movement to put American-grown flowers back on the nation’s tables. This country’s flower farmers didn’t always occupy such a tough spot. In 1991, domestic blossoms accounted for 64 percent of the nation’s flower sales. That was also the year that the United States entered into the Andean Trade Preference Agreement (ATPA), which eliminated tariffs on a number of products from Bolivia, Colombia, Ecuador, and Peru. Part of the War on Drugs, the pact had among its goals persuading South American farmers to cultivate flowers instead of the coca that ends up as cocaine. Colombia, in particular, quickly flooded the American market with cheap, duty-free cut flowers, devastating the U.S. industry, especially in California, which supplied 75 percent of the nation’s cut flowers before the passage of the ATPA. Once home to more than 500 flower farmers, the state claims just 200 today. Colombia is now the source of 78 percent of cut-flower imports to this country. An additional 15 percent come from Ecuador, with Africa, China, and Europe making up the difference. “I think we got traded away,” says Szukovathy, of the 1991 trade agreement. preserved with chemicals, and cut days or even weeks earlier. Finally, in 2013, a group of flower farmers led by Kasey Cronquist, the chief executive of the California Cut Flower Commission, established a “Certified American Grown” task force and commissioned a survey about the industry. Among the findings: 74 percent of consumers had no idea where their flowers came from, and more than half reported they would prefer to buy local blooms. A year later, Cronquist’s group partnered with Made In USA Certified, Inc., an independent agency that verifies the source of all kinds of products, to establish an identification system. began appearing on the sleeves of plastic bouquets in Safeway, Whole Foods, and Trader Joe’s stores in 2014. Ken Tirpak, director of the floral department at Oklahoma’s Reasor’s Foods, says that sales of one of the chain’s most popular bouquets shot up 30 percent after its stores began carrying the logo. The flowers in your typical supermarket bouquet were likely preserved with chemicals and cut days or even weeks earlier. “The label is a way for sellers to differentiate themselves from the competition,” says Debra Prinzing, the Seattle-based author of The 50-Mile Bouquet: Seasonal, Local, and Sustainable Flowers. Prinzing, who is widely credited with helping to spark the American-grown flower movement, launched slowflowers.com in 2014 to connect consumers to farmers, florists, and grocery stores offering domestic blooms. market share. In Wisconsin, eight growers joined forces to form the Fair Field Flowers cooperative, which uses an 85-square-foot truck to deliver online orders to buyers in the Madison area. At each dinner, a florist designed tabletop bouquets and a chef prepared a meal featuring food and flowers sourced from local farms. Your Farmer, Know Your Flowers.” Michelle Obama has made it a point to source more American-grown flowers for White House events. Consumers, too, seem to have a greater awareness of the implications of imported blooms. Last year, the Seattle market grossed roughly two times more than it had its first year in business—with 2015 sales close to a million dollars. At the same time, domestic farms are finding that flowers in the field can benefit the bottom line. Cronquist, who in addition to his California post serves as the administrator of Certified American Grown, cites a 2014 U.S. Department of Agriculture report that found floriculture among the most profitable crops for farms with 10 acres or fewer. urban farmer and floral designer. Four years ago, Culver began cultivating flowers in addition to the produce she grows at The Youth Farm—among the first in the country with CSA subscriptions offering flowers as well as vegetables. Indeed, the number of farms with sales from cut flowers in the country increased almost 20 percent between 2007 and 2012, according to the USDA. Culver credits the increased awareness to media coverage about the parallels between the local food and flower movements and to a handful of popular local flower–themed Instagram and Pinterest accounts. In just the last 12 months, she says, requests for flowers grown at The Youth Farm have tripled.